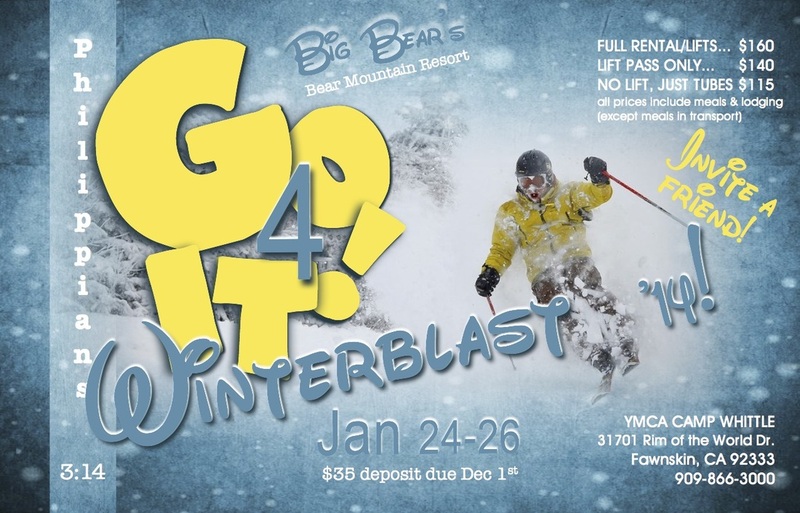 Snow tubers will enjoy nearby Big Bear Snow Play There you can pick up an all-day pass for their walk-on lifts and race your friends. HERE is their waiver. Click on the side picture to enlarge. Or you can DOWNLOAD & print your own Winterblast flyer here. * all prices include meals & lodging (except meals in transport). Checks can be made out to "Peace Lutheran Church" and placed in Mike's mailbox in narthex (or mailed to: Peace Lutheran Church 71 Loma Dr Camarillo, CA 93010). Please put in the memo section that check is for "Winterblast '14". * IMPORTANT * Here is Bear Mountain's LIABILITY release you need to fill out. And HERE is a YMCA Camp Whittle RELEASE to also download & bring with you. Check out Camp Whittle where we'll be staying. Here's a MAP. It's only about a 20-minute drive to Bear Mountain snow resort where we'll be hitting the slopes!